Details Liquid acrylic polymer emulsion useful for diluting and extending colors as well as increasing flexibility and film integrity. Wets out solids (pigments) more readily than other polymers and is useful for creating homemade acrylic paints. Is one of the most universal used in paint manufacturing. Artists who had used "Rhoplex" (a registered trade name) will find that this GAC most closely reflects the properties to which they were accustomed. Is useful for protecting against Support Induced Discoloration (SID). Is the most flexible with a moderate level of tack and gloss. Is useful for diluting and extending acrylic colors, especially when film flexibility and integrity are important characteristics. Common supports (i.e., cotton and linen canvas, hardboard, Masonite, medium-density fiberboard) contain water-extractable materials that can cause discoloration in transparent glazes. To minimize Support Induced Discoloration (SID), prime the support with two coats of GAC 100. Traditionally, rabbit skin glue (also known as hide glue) was used to reduce the flexibility of canvas before painting. Although rabbit skin glue does reduce flexibility, it is brittle. It is also hygroscopic, which means that it attracts moisture from the environment and tends to remain water-soluble. Even when the glue is completely dry, high humidity will re-introduce water into the glue, causing it to soften or swell up. Over time, this constant swelling and drying of the film can cause paint-film cracking and delamination. GAC 400 can be used in a similar fashion as rabbit skin glue to stiffen canvas. Although the GAC 400 will not quite achieve the stiffness of the rabbit skin glue, it does not remain water-soluble. Apply one or two coats directly onto the raw canvas, coating both front and back for maximum stiffness. It is imperative that it be applied directly to the raw canvas. It is ineffective over any other medium, and most likely will flake off and cause delamination of subsequent paint layers. Since it is an acrylic polymer, it is not hygroscopic. 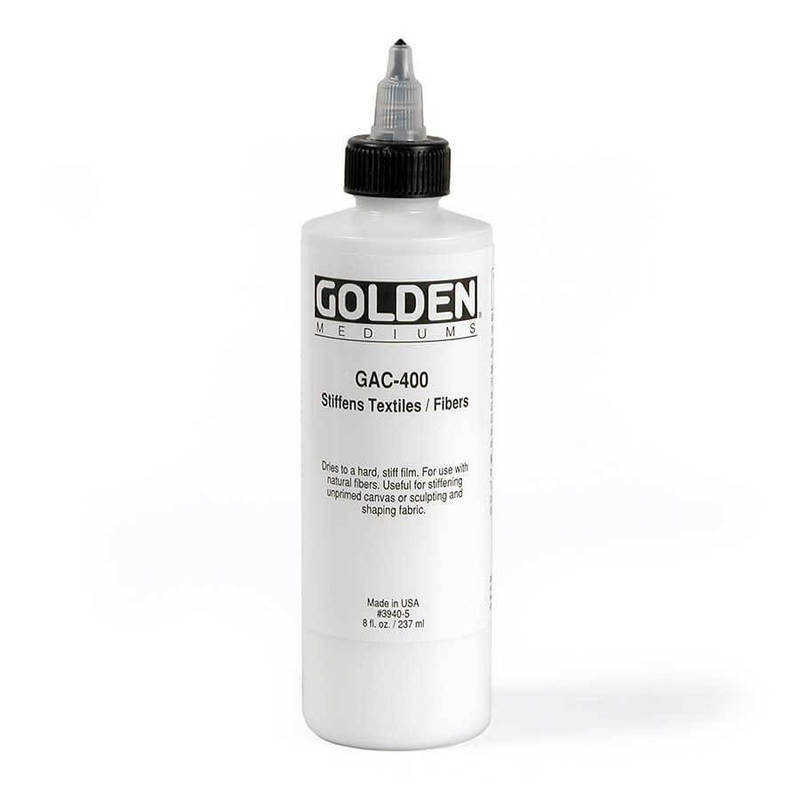 However, neither rabbit skin glue nor GAC 400 is completely effective against oil penetration, and the use of GAC 100 over GAC 400 is recommended for oil painters. Note: Since GAC 400 is brittle, it is important that it not be rolled tightly or bent back upon itself. This will cause cracking of the polymer film and may transfer cracks into additional paint layers. This is especially a risk with hardened oil paints. Two coats of GAC 100 before priming will substantially reduce linseed oil penetration into the canvas fibers. If stiffness and oil-blocking are desired, apply a coat of GAC 400 to both the front and back, directly into the raw canvas, followed by one coat of GAC 100 onto the front of the canvas. Follow this by the desired number of primer coats. Golden Artists Colors (GAC) acrylic polymers should be gently stirred or rocked back and forth prior to use, but should never be shaken, as this will incorporate significant amounts of foam that will be very difficult to eliminate. Foam can severely affect the transparency of the film causing a foggy or hazy quality. When applying with a brush, use minimal agitation and force, and do not overwork, as this too will result in foaming. GAC acrylic polymers are milky-white and relatively opaque while in the wet state, but when completely dry they will become transparent/translucent (depending on the nature of the specific GAC). The amount of time that an acrylic takes to dry completely is dependent on several variables, including film thickness, ambient temperature and humidity, air flow patterns and the absorbency of the support. A relatively thin film (approx. 1/16 inch) may take from 10 hours to 4 days to lose the milky quality, while a film 1/4 inch thick may take 2 to 10 days or more. It is important to note that film clarity occurs before the film has completely dried, or cured. The thin film mentioned above will take 2 to 3 weeks to achieve complete dryness, while the 1/4 inch thick film will take 2 to 4 months. This is very important to consider when determining how artwork is to be stored. When film transparency is critical, artwork should never be stacked or subjected to high humidity conditions.